AC Drive provides a compact multi-rated solution from 1/2HP to 1000HP for both variable torque and constant torque applications. 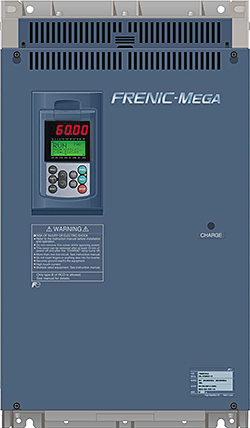 FRENIC-Mega full performance sensorless Vector control AC drive performs up to a 200 percent peak torque capability, or 120 percent variable torque flexibility. Includes built-in customizable logic functions, an EN594 safety input, and corrosion protection.